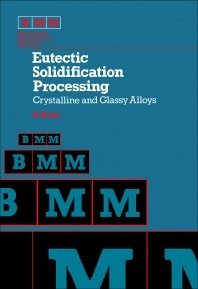 Eutectic Solidification Processing: Crystalline and Glassy Alloys deals with solidification theory and its application to eutectic processing of crystalline and glassy alloys. The underlying theme is an analysis of the different paths taken by the liquid-solid transformation as the cooling rate increases and a description of the structure and properties of the solid formed, ranging from equilibrium to metastable phase formation in castings, to metallic glass formation in splat quenched ribbons. This text has seven chapters; the first of which describes the main characteristics of the liquid-solid transformation. The chapters that follow show how control over composition, trace impurities, heat flow and cooling rate, and nucleation and growth gives rise to a wide range of solidification structures. Models of the nucleation and growth of eutectic and primary phases are analyzed and used to explain how cast microstructures are formed. Aluminum casting alloys and all types of cast iron are discussed, along with primary phase formation, the dependence of the extent of segregation on solidification conditions, and the practice of segregation prevention during solidification. This book also describes the importance of fluid flow in producing macroscopic segregation in large ingots and considers ways of minimizing this defect. Finally, this book gives a brief account of the various types of metallic glasses, their fabrication, important properties, and potential applications. This book will be of interest to materials scientists and industrial materials engineers.